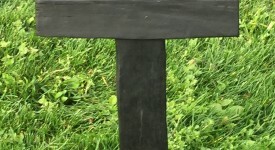 Home » What is Bog Oak? Bog Oak is an ancient oak tree that has been preserved in a black state in peat (bog). Bog wood is more ancient than the pyramids of Egypt and the prehistoric monuments of Newgrange. About ten thousand years ago, the ice age started retreating from Ireland. It left behind a land in which birch, lichen and willow grew. After another few thousand years, a forest of oak and pine covered the whole of Ireland. These great blankets of forest lasted five thousand years, before eventually succumbing to the growth of peat forming plants. They were eventually covered completely within the peat swamps. This period signaled the beginning of the Irish bog. There is nothing more uniquely Irish than bog oak. Bogs evolved and developed to a depth of several meters over thousands of years, concealing and preserving the remnants of these once great oak and pine woodlands. Bog Oak is an incredible wood and a rare form of timber that is unique to the bogs of Ireland. As the bogs have been reclaimed for agriculture or fuel by generation of the Irish population, huge roots and trees have been unveiled. The bog lands of Kildare and the Bog of Allen are vast living treasure troves for this precious and most coveted material. Once recovered from the bog, bog oak is awakened from its very long slumber and given a new lease life at the hands of the artist. The first step is to dry out the oak. This process takes on average two years, but can take up to four years. It can not be rushed – Using artificial means to speed up the process would only result in a material that is brittle and prone to damage. 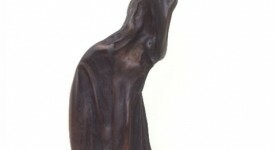 In his Bog Oak Studio in Clane, Co. Kildare, Larry then works on each sculpture for countless hours until the features and unique expression of the oak as preserved by nature are borne out. The sculptures are a testament to our unique Irish climate and heritage. 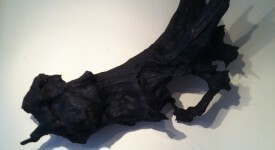 Copyright © 2013 Larry Harney, Bog Oak Sculptures. All Rights Reserved.